CUPERTINO, California—October 16, 2007—Apple® today announced that Mac OS® X Leopard will go on sale Friday, October 26 at 6:00 p.m. at Apple’s retail stores and Apple Authorized Resellers, and that Apple’s online store is now accepting pre-orders. Leopard is packed with more than 300 new features and introduces a brand new desktop with Stacks, a new way to easily access files from the Dock; a redesigned Finder that lets users quickly browse and share files between multiple Macs; Quick Look, a new way to instantly see files without opening an application; Spaces, an intuitive new feature used to create groups of applications and instantly switch between them; and Time Machine, an effortless way to automatically back up everything on a Mac®. Leopard’s new desktop includes the redesigned 3D Dock with Stacks, a new way to organize files for quick and easy access with just one click. Leopard automatically places web, email and other downloads in a Downloads stack to maintain a clutter-free desktop, and users can instantly fan the contents of this and other Stacks into an elegant arc right from the Dock. Users can also create their own Stacks for quick access to folders, documents or applications. Leopard’s gorgeous new look extends to all applications, with every window on the desktop offering a consistent design theme and active windows outlined by deeper shadows that make them stand out. The updated Finder includes Cover Flow® and a new sidebar with a dramatically simplified way to search for, browse and copy content from any PC or Mac on a local network. Content on any computer on a local network can now be searched using Spotlight™, browsed using Cover Flow or copied across the network with a simple drag and drop. .Mac members can use the new Back to My Mac feature to browse and access files on their remote Macs over the Internet. Quick Look is the fastest and easiest way for users to look inside files without launching them or even having the application that created them. With Quick Look, users can instantly view full-screen, high-resolution files of virtually anything, even media files, from any view in the Finder. Spaces gives users a powerful new way to organize their work by creating customized desktops which can contain only those applications or documents needed for each project, with the ability to quickly switch between Spaces with the mouse or keyboard. Time Machine lets users easily back up all of the data on their Mac, find lost files and even restore all of the software on their Mac. 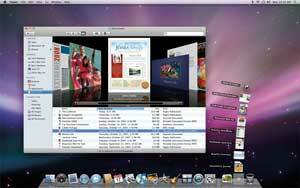 With just a one-click setup, Time Machine automatically keeps an up-to-date copy of everything on the Mac. * In the event a file is lost, users can search back through time to find deleted files, applications, photos and other digital media and then instantly restore the file. If it’s ever necessary, Leopard can also easily restore an entire system from the Time Machine data on an external drive. Mail has been updated in Leopard and features more than 30 stationery designs and layouts that look great on a Windows PC or Mac so users can easily send stylish, personalized emails with beautiful graphics and photos. Notes and To Dos help users stay organized by acting just like emails that can be easily created, saved as drafts, synced across multiple Macs and stored in Smart Mailboxes. Data detectors automatically sense phone numbers, addresses and events so they can be added to Address Book or iCal® with just a few clicks, and users can keep up-to-date by getting the latest news and blog feeds delivered directly to their mailboxes with a built-in RSS reader. iChat®, the easiest-to-use video conferencing application on any personal computer, offers even richer video chats in Leopard with iChat Theater, which makes it easy to show photos, presentations, videos or files in a video conference; screen sharing which lets users remotely view and operate another Mac; and Photo Booth® effects for fun distortions and video backdrops that can instantly make users appear to be anywhere they choose. and an updated version of Front Row, making it even easier to play music or watch movies, TV shows and photos on a Mac using the ultra-simple Apple Remote. Mac OS X version 10.5 Leopard will be available on October 26 at Apple’s retail stores and through Apple Authorized Resellers for a suggested retail price of $129 (US) for a single user license, and online pre-orders can be made through Apple’s online store (www.apple.com) starting today. The Mac OS X Leopard Family Pack is a single-household, five-user license that will be available for a suggested retail price of $199 (US). Volume and maintenance pricing is available from Apple. The standard Mac OS Up-To-Date upgrade package is available to all customers who purchased a qualifying new Mac system from Apple or an Apple Authorized Reseller on or after October 1, 2007 for a shipping and handling fee of $9.95 (US). Leopard requires a minimum of 512MB of RAM and is designed to run on any Macintosh® computer with an Intel, PowerPC G5 or G4 (867 Mhz or faster) processor. Full system requirements can be found at www.apple.com/macosx/techspecs. * Requires an additional hard drive sold separately. ** Copy of Windows XP or Vista required.